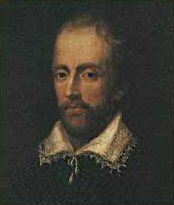 Edmund Spenser (c. 1552 – January 13, 1599) was an English poet of the early Renaissance who, along with his close contemporary William Shakespeare, brought about what would be a revolution in English literature. Spenser, like Shakespeare, represents a bridge between the medieval and early modern periods in English literary history. He drew on a wide range of sources, most notably Chaucer and the continental poets like Petrarch and Boccaccio, and merged them with a uniquely English sensibility. In addition to this, Spenser is perhaps the most important poet, in terms of technique, in England's history. Although Sir Thomas Wyatt is generally credited with writing the first sonnet in English, Spenser is almost unanimously seen as being the first poet to truly demonstrate the form's full potential. Spenser is likewise credited with introducing a number of poetic techniques which had first been invented one or two centuries prior on the Continent to a wider English audience, such as Petrarch's canzone and Arnaut Daniel's sestina. Spenser's poetry, likewise, is more Romantic in the sense that it is looking towards a nostalgic past rather than towards an uncertain future, than that of many of his contemporaries. Spenser was a close friend and an associate of the poets Sir Philip Sidney and Sir Walter Raleigh, both of whom, in addition to being poets, were wild, adventuresome, Renaissance men. His other close contemporaries include Shakespeare and Christopher Marlowe, both of whom, in one way or another, were writing in response to the massive change in thought and outlook resulting from the Renaissance. Spenser does not quite fit into this category. His most important poem, the massive epic The Faerie Queene is intentionally archaic, and was conceived by Spenser as a rejuvenation of the medieval code of chivalry and morality. He was also staunchly anti-Protestant and anti-Catholic, and a number of his shorter poems were written as polemics, in hopes of preventing the unity of the Anglican Church from being torn apart by the dissent of an increasingly dissatisfied people. For all these reasons Spenser's works seem anachronistic to contemporary audiences. However, it is important to recall the unique point in time in which Spenser lived. Unlike most of his contemporaries, he did not live long enough to see the full ramifications of the Renaissance developments that would radically change the prevailing paradigms in both science and philosophy during the course of the seventeenth century. Moreover, he was a man of low birth who spent most of his life away from London, in the intellectual backwaters of England. His own reading interests lay primarily in more ancient texts than most of the writers of his time. Spenser is a vital link between the earlier centuries of Middle English in the Middle Ages, and what would become the early modern era of English literature. Spenser absorbed all of the major writers of the previous two hundred years, including Chaucer, and Petrarch, and the Troubadours, creating a style and oeuvre that was immediately popular and apprehensible, making him one of the major figures (some would argue the major figure, even greater than Shakespeare) of English literature after the sixteenth century. Spenser was born circa 1552, and educated in London at the Merchant Taylors' School. He went to Ireland in the 1570s, during the Elizabethan reconquest of the country, to acquire land and wealth. From 1579 to 1580, he served with the English forces during the second of the Desmond Rebellions, and afterwards was awarded lands in Cork that had been confiscated from the rebels in the Munster Plantation. Among his acquaintances in the area was Sir Walter Raleigh who, like Spenser, had been granted land in Munster. Edmund Spenser, through his poetry, hoped to achieve a secure place at court but (partly as a result of foolishly antagonizing Lord Burghley) received only a pension in 1591 in recognition of his efforts. For most of his life he lived in Ireland, bitter toward not only the English court but to the Irish as well, whose culture Spenser disliked. In the early 1590s he wrote a prose pamphlet titled, A View on the Present State of Ireland. Although it was not published in Spenser's lifetime due to its inflammatory nature, this piece became quite famous after its publication in the mid-seventeenth century. The pamphlet argued that Ireland would never be totally 'pacified' until its indigenous language and customs had been destroyed, by violence if necessary. He recommended using scorched earth tactics, such as he had seen used in the Desmond Rebellions, to create famine. Although it has been highly regarded as a polemical piece of prose and valued as a historical source on sixteenth-century Ireland, the genocidal intent of the essay is now generally recognized. He also utilized Ireland's Celtic tradition for poetic source material. Spenser was driven from his home by Irish rebels during the Nine Years War in 1598. He died in 1599. The first poem to earn Spenser notability was a collection of eclogues called The Shepheardes Calendar, written from the point of view of various shepherds throughout the months of the year. The poem is an allegory symbolizing the state of humanity. The diversity of forms and meters, ranging from accentual-syllabic to purely accentual, and including such departures as the sestina in "August," gave Spenser's contemporaries a clue to the range of his powers and won him praise in his day. The Faerie Queene is his major contribution to English poetry. The poem, written in the epic form, is a long, dense allegory of Christian virtues, tied into England's mythology of King Arthur. Spenser intended to complete twelve books of the poem, but managed only six before his death. The work remains the longest epic poem in the English language, inspiring writers from John Milton and John Keats through James Joyce and Ezra Pound. He devised a verse form for The Faerie Queene that has come to be known as the "Spenserian stanza," which has since been applied in poetry by such disparate poets as William Wordsworth, John Keats, Lord Byron, and Alfred Lord Tennyson. The language of his poetry is purposely archaic. It reminds readers of earlier works such as The Canterbury Tales of Geoffrey Chaucer, whom Spenser greatly admired. Spenser's Epithalamion is the most admired of its type in the English language. It was written for his wedding to his young bride, Elizabeth Boyle, and it represents the first widely popular sonnet sequence written in the English language. The sequence would go on to inspire Shakespeare's famous sequence of sonnets several years later. The Faerie Queene is indisputably Spenser's masterpiece. Its publication was so popular that Queen Elizabeth herself would grant Spenser an appointment for life. The poem was written in an intentionally archaic style, Middle English spelling, dense classical allusions, and a medieval vocabulary. The poem, which is easily the longest epic poem in English and is impossible to summarize in a single paragraph, is a series of stories. Originally there were to be twelve, but Spenser only completed six in his lifetime, each of which focuses on one of King Arthur's knights of the roundtable, illustrating a particular virtue. Our best evidence for Spenser's ambitions for his epic—aside from the poem itself—is to be found in his prose letter to Sir Walter Raleigh, which is traditionally published as a preface in most editions of the poem. Unfortunately, there are enough divergences even between this letter and the 1590 Faerie Queene (the first three books), that there is some question as to its trustworthiness regarding the portions Spenser did not live to complete. According to the Letter to Raleigh, there were to have been twelve books, each of which was to focus on one of the twelve private virtues. Spenser names Aristotle as his source, but it is more likely that Saint Thomas Aquinas and the Thomist tradition, which derived from the theological re-interpretation of Aristotlean texts, such as the Nichomachean Ethics) dictated the catalog. Each book would feature one knight, who would be the embodiment of that book's virtue. In addition to these six virtues, the Letter to Raleigh suggests that Arthur represents the virtues of Magnificence, which "according to Aristotle and the rest … [is] the perfection of all the rest, and conteineth in it them all"; and that the Faerie Queene herself represents Glory hence her name, Gloriana. Using the letter as a guide to the poem, the relative absence of Arthur and Gloriana from the plot is surprising. Although they are both in a way integral to the structure of Book I, they continue to fade in importance as the poem progresses and Spenser's acute sense of irony is given more and more free-reign. The appeal of a project like this should be immediate to anyone with a systematic imagination. Scholastic classifications are regarded with more than a little skepticism, they still have application today. Some of Spenser's allegorical vices seem all-too-familiar. In Book I, the Knight of Holiness encounters the figure of Despair, and escapes only thanks to the unexpected intercession of Una, the True Church. Spenser's project in The Faerie Queene, then, is not dissimilar from the work of psychoanalysts, empirical psychologists, and analytic philosophers who study ethics and the emotions. Still, this poem is not didactic; it raises more questions about the virtues than it answers. Additionally this poem distinguishes itself in its treatment of how the tragedy of Divine-human separation is painful, not only to us, but to God Himself. Faerie Queene. Book v. Proem. St. 3. But simple Truth did rayne, and was of all admyred. Faerie Queene. Book iii. Canto xi. St. 54. Blatant Beast was a phrase Spenser coined for the ignorant, slanderous, clamor of the mob. However, the Blatant Beast from The Faerie Queene is clearly shown to indicate slander in general, and a large part of the final complete Book VI, although the Blatant Beast first appears towards the end of Book V, shows how thoroughly the Blatant Beast ravages the world. First spreading from the Court not the villages or slums and causing havoc everywhere it goes until it even penetrates into the monasteries and causes great distress there. Only Calidore, the most courteous of knights, was able to tame, chain, and imprison the Blatant Beast, which eventually would break free and, as The Faerie Queene concludes by saying, still ravages the world today since only two Arthurian knights ever came close to doing what Calidore did. Even The Faerie Queene, the text asserts, shall become a target for the Blatant Beast.